Shroud of the Heretic have toured extensively and have shared a stage with the likes of Grave Upheaval, Impetuous Ritual, Anhedonist and Ritual Necromancy amongst others, they play bleak, blackened, oppressive Occult Death Metal and it’s been reported that Revelations in Alchemy is their darkest work to date. Heavy rain, wind and occasional weird, creepy background noises introduce us to Shroud of the Heretic’s opener “The Arrival” and straight away it’s apparent they’re going to bring us on a bleak, oppressive, downright eerie musical journey. After close to two minutes of an introduction Shroud of the Heretic blast our ear drums with their ominous blend of blackened Occult Death Metal. At close to seven minutes this is one of four of the longer tracks from the album but it’s during these longer tracks that Shroud of the Heretic best showcase their bleakness and ability to create darkened atmospheres, seemingly at will. Bassist Thom’s vocal style is perfectly suited to the music, his low level growls accompanying the music well and adding to the intensely oppressive atmosphere. Heretical Screams follows, opening up at a faster pace but this pace soon breaks as Shroud of the Heretic slow things down and surround us with back-breakingly slow, doom laced melancholia. 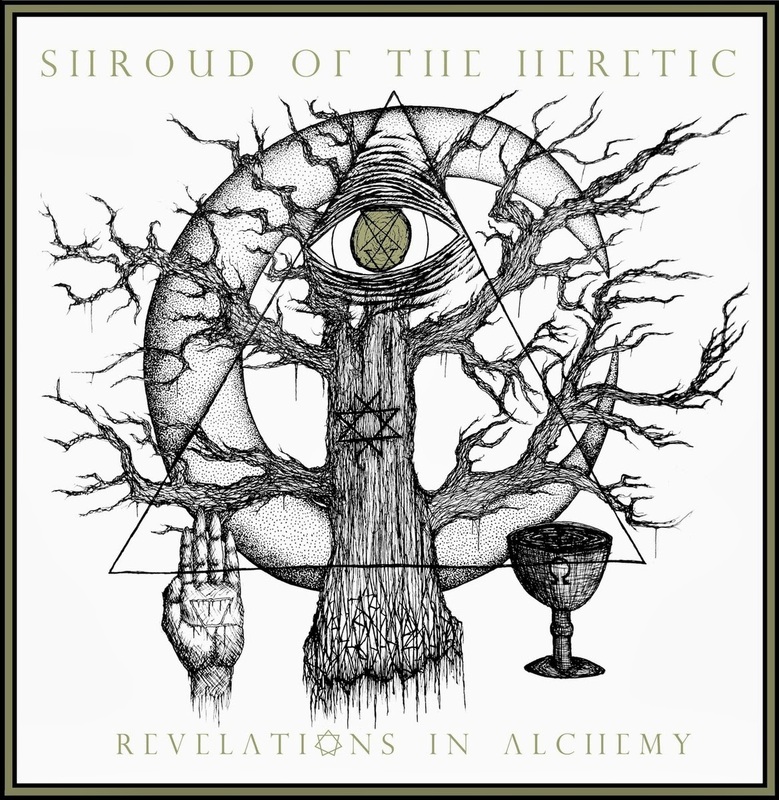 During Revelations in Alchemy Shroud of the Heretic play at varying speeds, from fast paced all-out death metal blasts to doom laden passages, yet the most prevalent factor is the pervading ominous atmospherics woven throughout the course of the album. I’ve often said Death Metal is currently in the midst of its most productive and creative period since the early 1990’s and within this genre there’s a splinter group of bands standing out from the rest of the pack with their take on Death Metal that uses more organic sounding production and darkened atmospherics – bands playing this style of Death Metal have ditched shiny production and technicality in favour of a more natural sounding approach which, when carried out effectively, can sound much more authentic and miles more atmospheric than many of their contemporaries. Bands like 'שְׁאוֹל (Sheol), Malthusian, Abyssal, and Heresiarch are, in my humble opinion, leading the way in terms of originality and authenticity. Shroud of the Heretic also fall into this category, their music does exactly what they intended it to do and it’s as bleak and atmospheric as you’ll hear. If you’re looking for something overly technical or with clean, crisp, polished production you just won’t get or understand this album, but if you’re after some genuinely eerie, oppressive, suffocating, bleak death metal this is an album for you; the atmospherics are worked extremely well throughout and it’s another release that stands out from many of its rivals. Revelations in Blasphemy is available now from Blood Harvest Records.